This is a typical Sichuan dish, a cheap comfort food. The bits of minced pork resemble the ants climbing up the pile of noodles like the tree branches/twigs and maybe the spring onion bits look like the leaves? Funny Chinese imagination ;) and not very foodlike! Last thing I want to eat is a plateful of ants and tree branches. Anyway aside from the name, this dish is yummy and worth a try. Glass noodles are essential for this dish not to be confused with rice vermicelli. Some people called them cellophane noodles or mung bean threads on some packaging. Glass noodles are made with mung bean flour. This is the best brand of glass noodles I know called 龍口粉絲 (Longkou fun se) , easier to use the little packets than a big pack. One tip: glass noodles are very tough to cut with knife before soaking, use a pair of kitchen scissors. 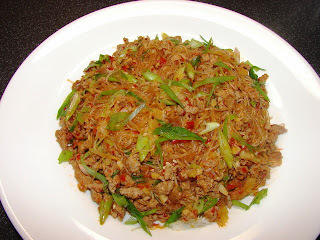 This dish is not eaten as a noodle dish on its own, normally with rice and other dishes. Soak glass noodles in warm water till softened about 15 minutes, then drain. Heat oil in wok, add ginger and garlic, stir for about 15 seconds add chilli bean sauce stir till fragrant. Add minced pork, loosen the meat with then back of stirring spatula while in the pan, cook till brown. Add soy sauce and sugar to taste. Add chilli if using. Then add celery, stir for about 30 seconds. Add glass noodles and stock/water stir fry till piping hot for few minutes and the noodles have absorbed all the liquid. Sprinkle with a little chilli oil if wish. Dish up and garnish with more spring onions or chilli. Can sub pork with chopped raw prawn. For a vegetarian version, sub pork with a handful chopped shitake mushrooms. Also remade Fish Fragrant Aubergine a couple of days ago, it tasted much better than last time - I think careful frying of the aubergine was the key. Very dark though, I used a particularly treacly dark soy. If garlic fends off colds, I've eaten enough the last few days to combat the piggiest of flu! With the FF aubergine, best deep fried or shallow fried till the aubergine is nice and brown and caramelised, it's much sweeter and meltingly soft that way. If you are conscious, after frying rest aubergine in a sieve to drain off excess oil. Thank you for the brand recommendation on 粉絲! I found the 龍口 ones in Loon Fung, and they're a lot better than the ones I was using before — much nicer texture. Thanks for the recipe, too — I made it the other day and it turned out great. I couldn't figure out from the recipe whether I should keep back all the spring onions to add at the end, or not. I decided to add most of them with the celery and the rest at the end, and that worked fine.